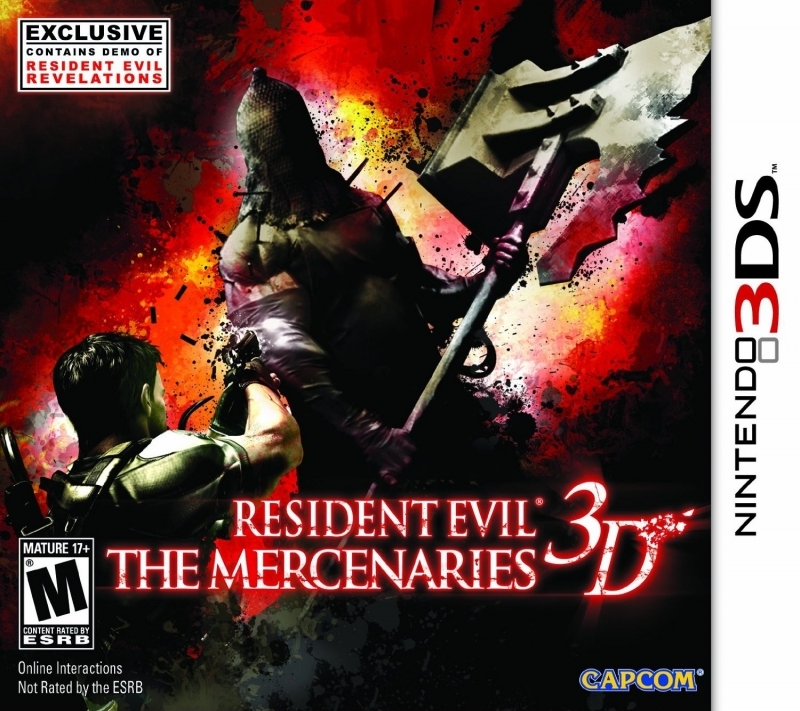 For the first time Resident Evil: The Mercenaries 3D delivers the intense Mercenaries gameplay experience on a handheld console. 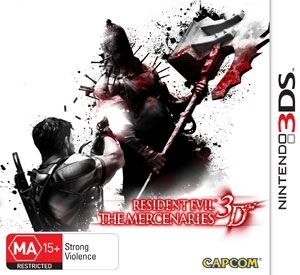 Featuring the Mercenaries stages from Resident Evil 4 and Resident Evil 5 re-mastered for the Nintendo 3DS system, it's a race against time as you try to defeat as many of the infected enemies as possible before the countdown reaches zero. 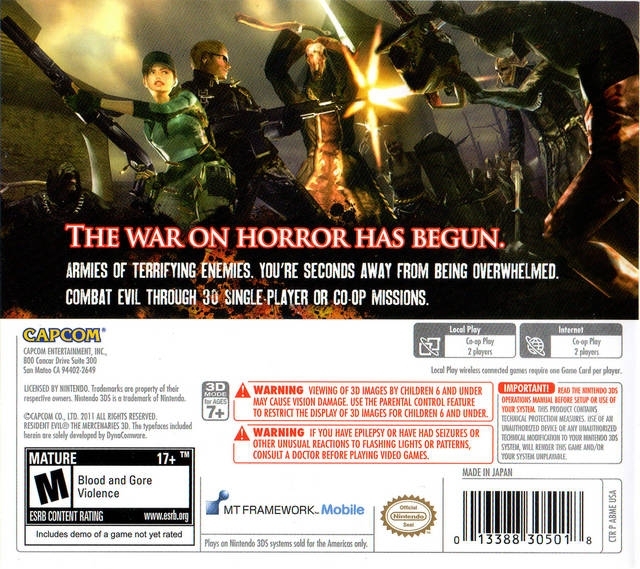 The fast-paced, combat intensive action of Resident Evil: The Mercenaries 3D is available both as a solo experience, or gamers across the world can team up and enjoy two-player co-op either wirelessly or online and work together to take out as many infected and Bio-Organic Weapons (B.O.W.) as possible. 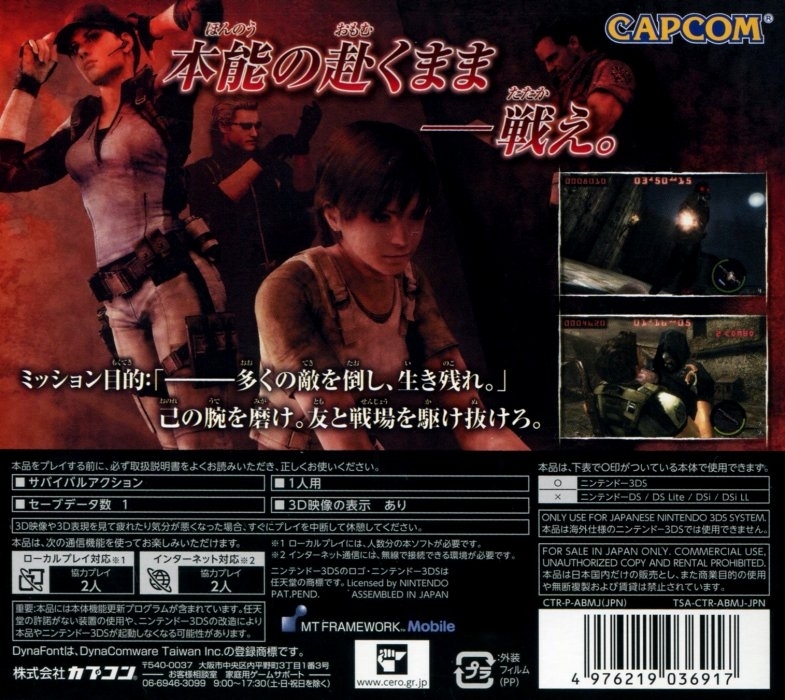 The action takes place over 30 missions in classic areas from RE4 and RE5 including the Village and The Mines. Gamers will have the opportunity to tackle the game's missions with 8 legendary Resident Evil characters from past and present: Chris Redfield, Jill Valentine, Krauser, Hunk, Claire Redfield, Albert Wesker, Rebecca Chambers and Barry Burton. You will also face off against some of the most terrifying enemies and B.O.W.s that have ever been seen in the Resident Evil series, including the Executioner and Popo Karimu. The mission ends if you complete the mission conditions that have been set for that stage or once the timer has run out. Don't worry though - you can add more time to a mission by destroying the time bonus columns or using physical attacks to take down enemies (rather than shooting them!). The faster you clear the missions, and the more melee attacks you use, the more points you will earn. 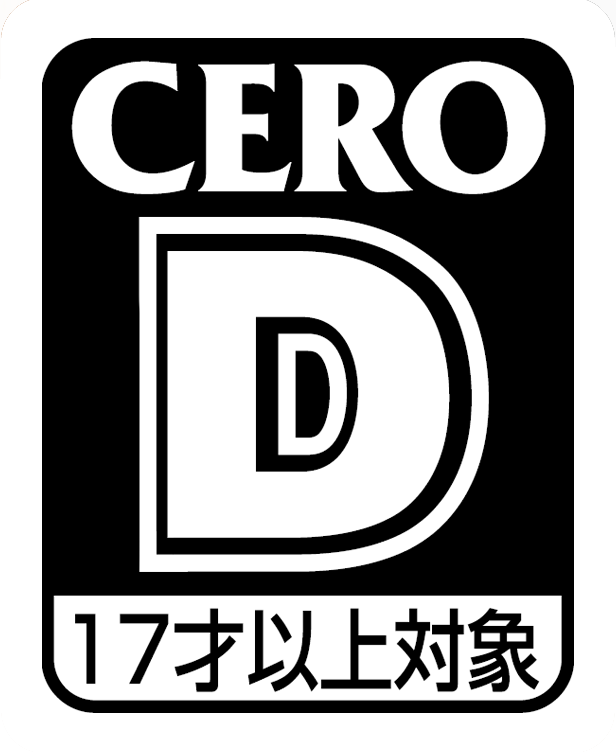 At the end of each mission you will be awarded a rank for your performance, ranging from the lowly D to the superb Double 'S' rating. Throughout the game you will be able to unlock additional costumes, skills and weapon sets to increase the killing efficiency of your mercenary. The skills improve a variety of your mercenary's abilities or their weapons - select the right combination to build up massive scores! As you clear missions you will also be able to unlock extra costumes for the characters and unlock new weapon sets. There are also 50 different medals to unlock in the game and these are rewarded for a completing a variety of achievements in the game. 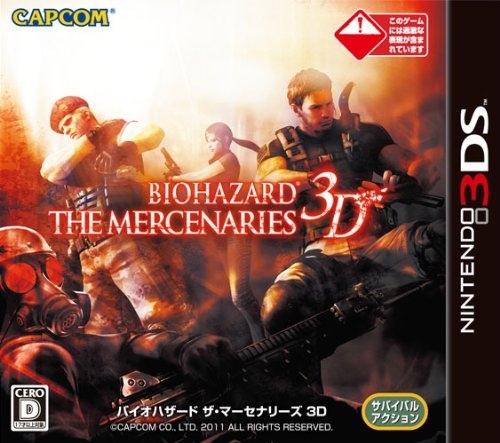 While the gameplay will be familiar to those who have previously played Mercenaries, changes have been implemented to take advantage of the Nintendo 3DS system, most notably transforming the stages and characters to full 3D. 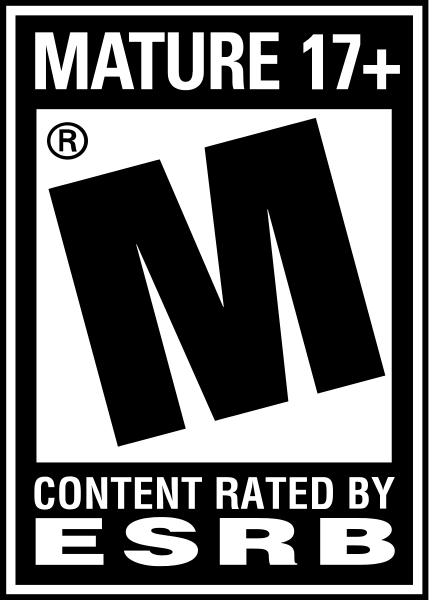 Players also have the ability to make the characters move and shoot and switch weapons on the fly using the Touch Screen functionality. Resident Evil: The Mercenaries also includes a demo for the upcoming Nintendo 3DS exclusive title Resident Evil: Revelations. Includes a playable demo of the forthcoming Nintendo 3DS title, Resident Evil:™ Revelations. i agree. 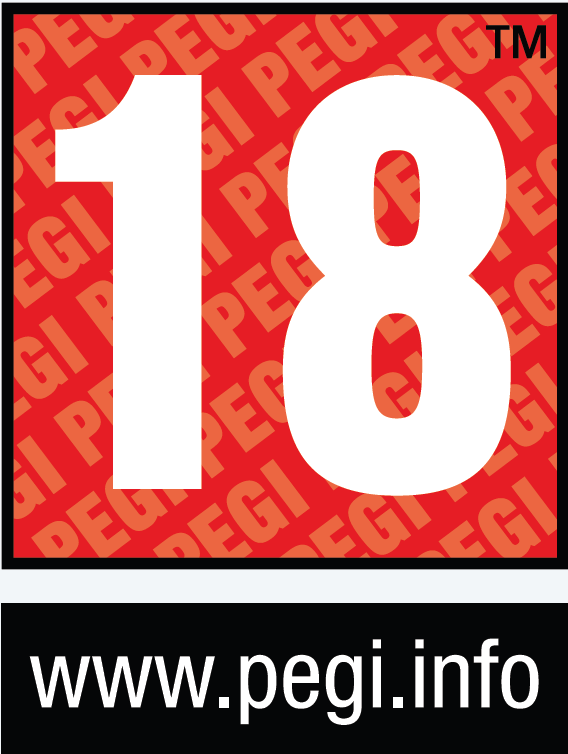 this game should sell pretty well on the eShop. This game has had a second chance through the digital version sold on eShop. That version allows you to delete your saves, unlike the retail version. A lot of people got this game when it went on sale o eShop for just $9.99 and it still has a very active online community. due to the one saving slot and impossibility to reset the few used copies I saw around are sold very cheap. I bought a few at HMV for £2.98 and sold them on ebay for £10. Not bad. At least i did pay my copy back. Just wow at thewastedyouth...what are you talking about? Do you even own the game? I do, and i can personally vouch for there being no single player campaign. You play through stages and repeat then, yes i said repeat them unlocking more weapons as you go etc. you really need to get your facts straight before posting ill informed comments. You can replay the game believe me i have done many many times.